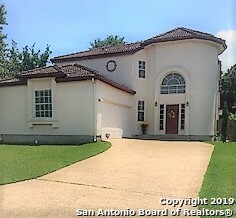 All STONE MOUNTAIN homes currently listed for sale in San Antonio as of 04/22/2019 are shown below. You can change the search criteria at any time by pressing the 'Change Search' button below. "Move-in ready home with mature trees in the very desirable Stone Mountain Community. Custom playground in backyard with newly stained deck and fence plus a storage shed! New, shade tolerant sod laid in backyard. Fresh paint throughout and new carpet in Master Bedroom. Spacious bedrooms, oversized storage closet, and shelving unit in the garage make this a home you don't want to miss! One block away from community pool, park and playground and close to shopping, great schools and medical center." "This wonderfully updated home in Stone Mountain features newly updated quartz countertops in the kitchen,grand vaulted ceilings in living area,and a private master suite located on the first level. The HVAC system is a new system and upgraded to properly heat and cool the entire square footage of the home.The cozy feel if this him flows out into the backyard where you will experience a private patio area shaded by trees and a private garden with your very own peach tree and ample space for enter"
"Gorgeous home with stunning entry and staircase. Open floor plan with high ceilings and lots of windows providing natural light. FP in living room. Kitchen has beautiful white cabinets with granite counter tops and island. Bonus room off kitchen. Master bedroom downstairs. Oversized master bath has separate garden tub and shower, skylights and double vanity. Two nice size bedrooms and bathroom upstairs. Tile roof. Covered patio. Easy manage backyard with mature trees. Seller may help buyer's clo"
"This is a 3/2 custom built home with ample room. Open floor plan with separate dining area, inside utility, fireplace, large mstr bdrm and bath, island kitchen, and huge living room. Large deck in the backyard. Short Sale, sold AS IS. Come make this home yours!"